The Bryant Hornets will try to take it a 13-game winning streak right into the Class 6A State Tournament but, to do that, they’ll need to beat a Conway Wampus Cats team that will be celebrating Senior Night and hoping to avenge a last-second 61-59 loss at Bryant on Jan. 25. The seeding and the conference standings are set. Tonight’s games are the regular-season finales. The Hornets are the 6A-Central Conference champs and the top seed in the State tourney. Conway is second and has a bye as well. But it’s a rivalry game and no one will be taking it lightly. The Hornets want to stay hot. Their 13thconsecutive win came over North Little Rock on Tuesday at the Hornets’ Nest. They’ve actually won 18 of their last 19 games after a 3-3 start to the season. Conway is 10-3 in league play after a 70-43 win over Little Rock Catholic on Tuesday. The Wampus Cats are 19-6 overall. The State tournament begins on Feb. 27 at Bentonville West High School. Both Bryant and Conway will play on Thursday, Feb. 28. Meanwhile, in the girls’ game, Conway’s 2 seed is set. Bryant is still trying to push up to a 4 seed. But they’ll need a win over the Lady Cats, who are 25-4 overall and 11-2 in the league after a 72-38 win over Mount St. Mary on Tuesday. Or they could get the 4 if Mount St. Mary, at home, upsets Little Rock Central. The Lady Hornets’ worst losses of the season were to North Little Rock and Conway on back-to-back games in late January. 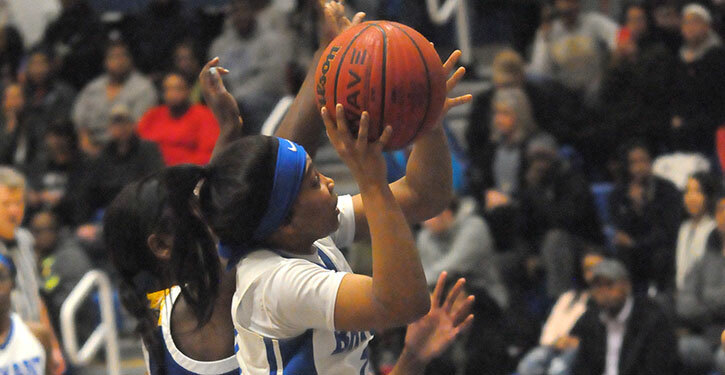 But they came back to make North Little Rock earn a 70-60 win on Tuesday and they’ll hope to do the same or better against a Conway team that hit 18 3-pointers at Bryant in a 73-34 victory. As a 4 seed, the Lady Hornets would open State against Springdale at 5 p.m., on Wednesday, Feb. 27. As a 5 seed, they’ll start the tourney against Van Buren at 1 p.m., Wednesday.